On September 6, 1955, the Laurel-Langley Agreement was approved by both the American and Philippine governments following the conclusion of negotiations between Senator Jose P. Laurel and James M. Langley in December 1954. 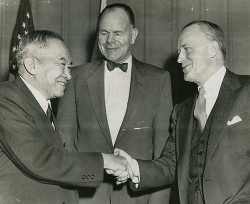 The Laurel-Langley treaty was a revised United States-Philippines Trade Agreement replacing the Bell Trade Act, which became unpopular among Filipino nationalists due to provisions which tied the Philippine economy to the U.S. economy. The treaty, which took effect on January 1, 1956, expired in 1974. It abolished the U.S. authority to control the exchange rate of the peso, made parity privileges reciprocal, extended the sugar quota, extended the time period for the reduction of other quotas and for the progressive application of tariffs on Philippine goods exported to the U.S.